The Poetry Studio belongs to Elizabeth Hansen, an American visual artist who works mainly with photography and video installations. She lived in Paris for 10 years when the residency studio was her work place. In 2013, she moved to Switzerland and settled in a village near Trelex. There she met Nina Rodin, the founder of the Trelex Residencies and she experienced first-hand the open studios, the coffee mornings and the impromptu exhibitions generated by the artists who came there for free and on a first-come, first-served basis, without application forms. This inspired Elizabeth to take the leap and turn her beloved studio into a poetry residency. She didn’t want to take apart the studio and rent it to a stranger. In her own words, it adds more value to the world to let artists use it than the rent is worth. As for Elizabeth’s insistence that it be used exclusively by poets, I think this boils down to two aspects. For one, she saw for herself in Trelex how messy visual artists can be if allowed (!) and she was clear that she didn’t quite dare let just any artist come that might be interested. Secondly, Elizabeth has a huge fascination for poets and poetry. She talks about the economy of means inherent to poetry that seems a natural match to the tightly organised space of the studio. Also of the radical nature, the bare bones of poetry within the wider spectrum of literature and she yearns to support those writing practices that have the least hope of commercial success but are none-the-less genuine, sincere and therefore just as necessary. This residency runs on the Trelex Model of residencies which has no application forms. No application forms means complete artistic freedom. Trelex residencies are allocated on a first-come, first-served basis to any interested and motivated artists; are advertised by word-of-mouth; and are free (see how to apply tab above). At the time of writing, there are Trelex residencies in Trelex, Switzerland and in the Peruvian Amazon. But wherever they are, Trelex residencies try to promote exchange, discussion and collaboration. So even here in Paris, where we can only host one artist at a time, we have worked at setting up a network of poets and people interested in poetry (see tab above) who look forward to welcoming you and linking you into the Paris Poetry community, as much as they can. 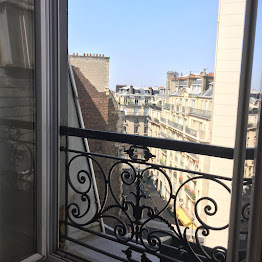 Residents also become part of the Trelex Residents alumni network and every Paris residency poet will be expected to support a subsequent resident: to be in email contact before and throughout their residency and answer as many questions and queries as they can. Through a combination of this buddy system; the blog entries with which residents populate this website (see news tab above) and through the role of residents in spreading the word and finding the next wonderful resident, the Trelex residencies are run as much by the artists they have welcomed as they are by Nina Rodin and her team.